In one of the best years in boxing in recent memory will get even better with another marquee matchup between two-division WBO super featherweight world titleholder Vasyl “Hi-Tech” Lomachenko (9-1, 7 KOs) and undefeated WBA / WBO / IBO junior featherweight world champion Guillermo “El Chacal” Rigondeaux (17-0 1 NC, 11 KOs) in a much anticipated, long-awaited showdown between two top ten pound-for-pound fighters to determine who is one of the best fighters in the world. 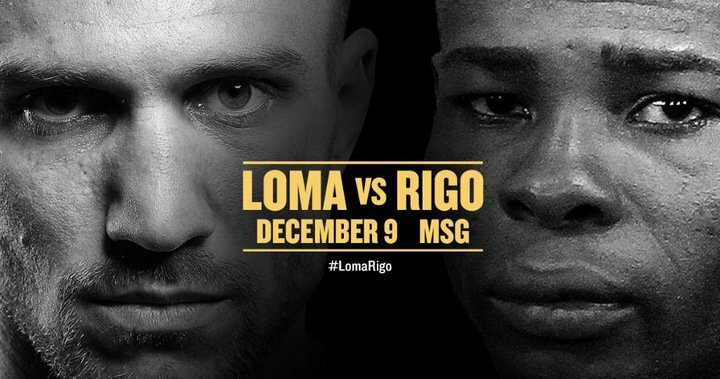 This bout will be televised on ESPN from Madison Square Garden in New York City this Saturday, December 9th. Lomachenko is ranked the second best pound-for-pound fighter in the world by ESPN and third by Ring Magazine. He has won eight in a row, six by knockout, since his lone, controversial loss to former world champion Orlando Salido, via a split-decision, in just his second professional bout. Salido missed the divisional weigh-in and weighed almost twenty pounds more than Lomachenko on the night of the fight. He also constantly threw illegal low punches throughout the bout, but was never warned about his infractions by referee Laurence Cole. Lomachenko has tried on several occasions to obtain a rematch with Salido, who has turned down these offers. He beat undefeated world champion Gary Russell, Jr. in his third bout, tying the record with Saensak Muangsurin for the fewest fights to win a world title. He made three successful title defenses of his WBO featherweight belt, after which he moved up to the super featherweight division and won a second world title when he defeated Roman Martinez. With the fifth-round knockout victory, he set the record for the fewest fights (seven) to win a world title in two divisions. This will be his fourth world title defense of his WBO super featherweight belt, which will be on the line for this fight. Rigondeaux is listed seventh by ESPN and fourth by Ring Magazine as the best pound-for-pound boxer in the world. He won the WBA super bantamweight title against unbeaten Rico Ramos, upset then fighter-of-the-year Nonito Donaire for the WBO title, and added the IBO strap in his last outing against undefeated mandatory challenger Moises Flores. Rigondeaux has made nine world title defenses, which will remain intact regardless of the outcome of this bout. Both fighters are two of the best amateur fighters of all-time. Lomachenko amassed an amazing (396 – 1) record and successfully avenged that loss twice. He won silver and two gold medals at the 2007, 2009, and 2011 World Championships, respectively. He also received a gold medal in the 2008 and 2012 Olympics for Ukraine. Rigondeaux has an equally impressive record (463 – 12) which included gold medals at the 2000 and 2004 Olympics for Cuba. He won gold medals at the 2001 and 2005 World Championships and was a seven-time Cuban national champion (2000 to 2006) from the country that produces some of the best amateur fighters in the world. He defected from Cuba and turned professional in 2009. This is the first time in boxing history that two-time Olympic gold medal winners will face off against one another. Lomachenko has youth on his side since he is eight years younger than Rigondeaux (37 to 29) and is bigger in size (two inches taller). He has also been the more active boxer between the two over the last couple of years. This will be his third fight in 2017, whereas Rigondeaux has fought just four times over the last three years and only three rounds in the last two years, which can become a significant problem for older fighters. Rigondeaux will also be at a disadvantage by moving up two divisions (eight-pounds) to a weight class where Lomachenko has already fought three times in. According to CompuBox, Lomachenko has the slight edge in terms of offensive and defensive statistics. He has boxing’s best plus/minus ratio, now that Floyd Mayweather has retired at 20.9 (punches landed minus opponents connected shots). He also holds a better power-connect percentage (49.4 to 47.4), and a lower opponent total connect percentage (16.1 to 16.8) than Rigondeaux. Rigondeaux does have a lower power punch connect percentage (19.9 to 22.7) than Lomachenko. Lomachenko is the better offensive fighter who has more power and accuracy, while Rigondeaux has the slight edge in defense and hand speed. This is the best opponent that either fighter has faced thus far. Since both boxers have equally impressive accomplishments, both in the amateurs and at the professional level and are considered two of the best skilled, pure fighters in the world, it will make for an extremely competitive and intriguing matchup. Nevertheless, Lomachenko should prevail by a twelve-round unanimous decision in a very technical, yet entertaining bout.